When it comes to domestic life, housework is my nemesis. It always has been. Don’t get me wrong, I do the housework. After all those floors will not clean themselves. It’s just, I always feel like I’m behind on it. It’s as though the more I do each day, the further behind I feel. I know I’m not the only one who struggles with feeling like this, at least I hope I’m not (please tell me I’m not alone in this) So why would someone who has a love-hate relationship with house cleaning be super excited about spring cleaning? Because it’s a fresh start. Just like spring brings with it new life, spring cleaning my home brings a new beginning. It’s hard to feel behind when your windows are sparkling, and you know that every surface has been cleaned and freshened up. So today, in addition to sharing some more spring cleaning printables, I’m also sharing my scatter-brained approach to spring cleaning. Every year my spring cleaning plan changes. Some years I do a complete top to bottom cleaning of everything, and other years I just tackle the often overlooked and under cleaned areas (think behind and under furniture, and light fixtures). The point is that every year I do something and then revel in feeling like I’m actually on top of things for a few weeks or months. Every year I spring clean in some way, but my approach to spring cleaning is far from organized. I won’t go so far as to say that I look forward to spring cleaning, but I will freely admit that I look forward to the results. No matter which way I end up choosing, all out or just a little where needed, I’m left feeling like I’m finally ahead on this thing we call housework. Like everything I seem to do, my approach to spring cleaning is a little… well, scattered! Oh, I sit down and make a plan. Sometimes I make two, or three, but it never fails that after the first couple of days I ditch the plan and end up all higgledy-piggledy in my implementation. But you want to know a secret? It WORKS for me. If there is one thing I’ve learned on my journey towards a more organized life, it’s that you have to do what works for you, even if other people think you’re crazy or nuts. Always work from the top down. It just makes sense, and I hate having to re-clean something because I did it the other way around. The toilet is always the last thing cleaned in the bathroom. For goodness sakes, if you must clean the toilet first toss that rag in the wash and use a fresh one to clean the rest of the bathroom. Toilet germs are gross! Other than those two things, I just do things the way that works for me. As long as things are getting done, does it really matter how? If you’ve been following along for a while now, you know that I’m a big believer in having a plan. A plan allows you to get those pesky tasks out of your head and allows your brain to stop worry about forgetting them and frees up space to focus on the doing. I like to take a priority approach to my spring cleaning plan. This way I know I’m going to tackle the tasks that really need to be done first. I know that at the beginning I’ll be all gung-ho and full of energy to get these things done and that by the end I’ll be at that stage where I have to force myself to finish. I also know, that the longer it takes me to get everything done, the more likely it is that life will happen and I won’t be able to make it to the end of my list in a timely manner. So I take full advantage of that first burst of energy to tackle the stuff that I know needs my attention. My spring cleaning plan always starts with rooms that I know need extra attention, like the bedrooms. Sure they get cleaned throughout the year, but I like to give them a thorough scrub in the spring. Is there anything better than a bedroom that is clean and shiny and ready for you at the end of the day? I also take this time to rearrange the rooms if needed, since I’m pulling the beds and furniture out anyway, it’s a great time to change things up. 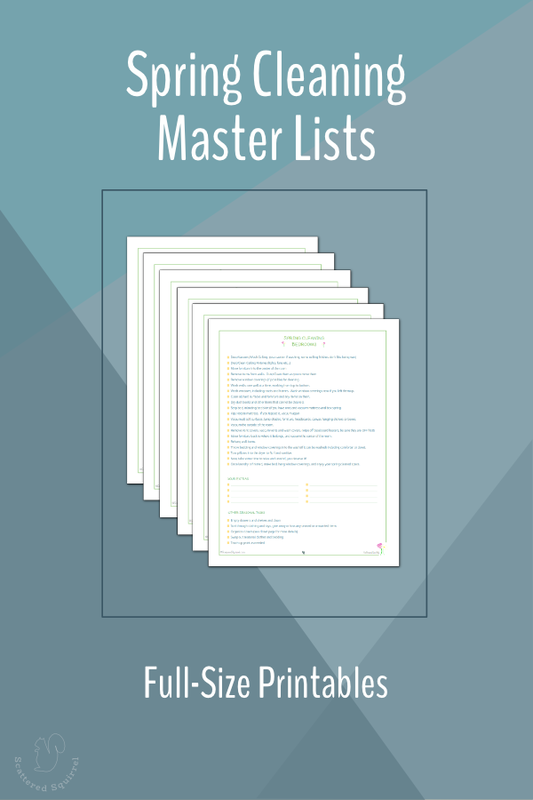 My room-by-room master checklists come in really handy for this part, as they have a detailed list of everything that needs to be done. So I don’t have to think about that part. It makes this part of the planning session super easy! Next up, I take some time to jot down any task that needs to be done house-wide. Windows always top this list, because we live in a very humid area and they need to have their frames and tracts cleaned at least twice a year (spring and autumn for me) and there is something so refreshing about sparkling clean windows. Now, these ones are my top priorities. It doesn’t mean I won’t do more than these, this is just where I will start. I can get a little something done in each room and this makes me feel like I accomplished more than if I just did one room a day. all-purpose cleaner – 50/50 vinegar and water mixed into a spray bottle. cleaning buckets one large one small, for different projects. window cleaner – 50/50 vinegar and water with a tablespoon of blue Dawn. I gather all my supplies and keep them in my cleaning bucket. I will leave them out where they are easy to grab to go tackle a spring cleaning task when I have the time. Having the checklists with the supplies means that when I whim to clean hits, I don’t forget to jot down what I did. Which leads me to my approach….. I start with the best of intentions but always end up in a confusing whirlwind of spring cleaning zeal, and then I crash in exhaustion and exasperation because I’ve ended up leapfrogging all over the house. pick a task and start working my way through the home on that task. I always start upstairs in the bedrooms. get to the last room or area upstairs and decide that I need to do something else in that room. run upstairs and complete that other random task in the room, then decide I need to do another one in that room, and another, and then another. next day opt to start a totally new task, and make it through upstairs and part of downstairs before getting sidetracked with more detailed cleaning in a room or area. Sometimes this is cleaning and organizing a closet, sometimes it’s pulling all the furniture into the middle of the room to clean behind and under. then decide to start another task, like cleaning vent covers, since I’ve already pulled up the ones from that room. So I’ll run around grabbing vent covers and I’ll get them soaking in the tub, only to forget about them until it’s time for one of the boys to have their shower, and then I’m scrambling to get them out of the tub and cleaned. I leapfrog through my spring cleaning. Not all the time, but most of the time. I’ve stopped letting it get me down and I’ve started working with it. Making a detailed plan, assigning tasks and rooms to certain days, and leaving myself step-by-step instructions, and embracing my scatter-brained nature and allowing myself the freedom to flit from one thing to the next really does work for me. I get things done, in an oddball, makes no sense, most certainly not the way my mother taught me, kind of way, but does it really matter how as long as the results are there? My spring cleaning checklists make it so easy to stay on top of what I’ve already done. I can hop all over the place and still get everything done. And the best part is that you can find them all in Spring Cleaning section of the Home Management Printable Page, well all except the ones I’m about to share. I couldn’t just make them half-size. Just like with the ones I shared last week, I felt these ones needed a little updating too, so in addition to make the new half-size version, I’ve also got a new full-size version for you as well. I kept it simple, nothing too fancy, and put them together into PDF packs, so you have all the pages in one file. Just click on one of the images below depending on which size you want. So there you have it. Now you know that I have a very scatter-brained approach to spring cleaning, but because it works I’m not going to stress it. It’s sort of like my Scattered Days, but on a more focused, much larger scale. All I know is that it seems to work for me. I may go slightly crazy for a week or two, but the results… oh those results are so worth it! Ok, tell me the truth…. am I the only one who feels like they are always behind on the housework? Previous Post: « Spring Cleaning Checklist Craziness!!! The results make it worth it in the end, I just keep reminding myself of that when I’m in the middle of cleaning and want to throw in the towel or rag. lol The way I look at it, as long as it gets done, it doesn’t really matter how I did it. Good luck with your spring cleaning this year! This is me. Oh so me. Except even in just my normal cleaning, for the most part. I will get oh so excited about something, to get about half way and either lose steam, or to get entirely distracted by something awesome I found…or something awesome I thought of while cleaning! I will definitely have to take a look at all of your lists. 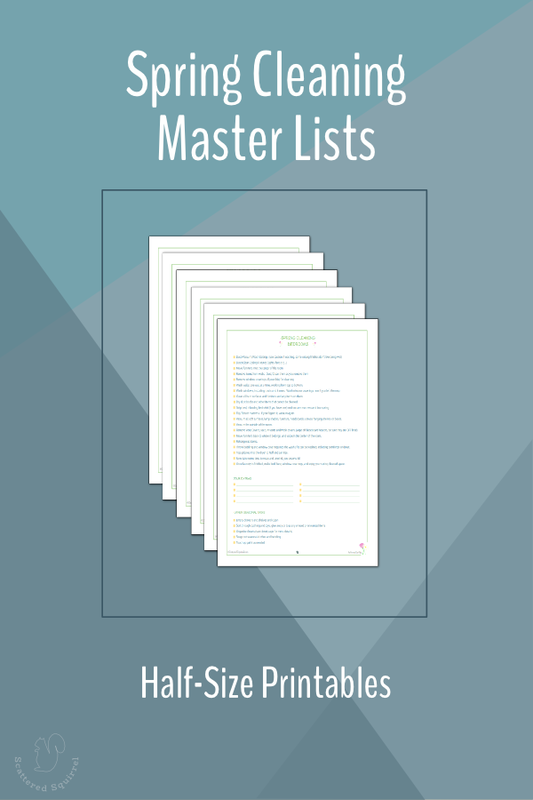 As we are in an apartment, a lot of the Spring lists don’t apply, but knowing your printables, I’m guessing you have just about everything imaginable covered, and all I have to do is just delete what we don’t have! Oh my yes, I totally always feel like I’m behind on housework. Being a housewife I put a lot of pressure on myself as far as my home goes and often end up stressed and guilty haha. Great tips on spring cleaning. I’m trying to get mine done soon as well! It really is hard to beat back the guilt and stress of not having a perfectly clean home when we’re stay at home wives isn’t it? I put that same pressure on myself though I’m learning to embrace the fact that I cannot do it all. (It’s a slow learning process lol) Good luck with your spring cleaning! I also used to have a scatter-brained-approach to spring cleaning and I used to hate cleaning just because I wasn’t effective and I was approaching the whole process wrong! Now I work as a cleaner! 🙂 I am very happy that I found checklists and schedules! Now I love doing it ! Thanks for the post! I will try your plan! It is always nice to try out some new ideas! Thank you! Greets, Sofa Cleaner Ltd.
How we approach the cleaning process certainly does make a difference in how efficient we are getting things done. I’m happy to hear you found your path, and I would love to hear what you think after trying my plan.